SINGAPORE – The last time steampunk fantasy author Gail Carriger was in Singapore, she accidentally promised to write a Merlion into her next book. The New York Times bestselling author, 42, had given a talk at the 2016 Singapore Writers Festival, during which she was met with applause when she suggested she might set a book in Singapore. 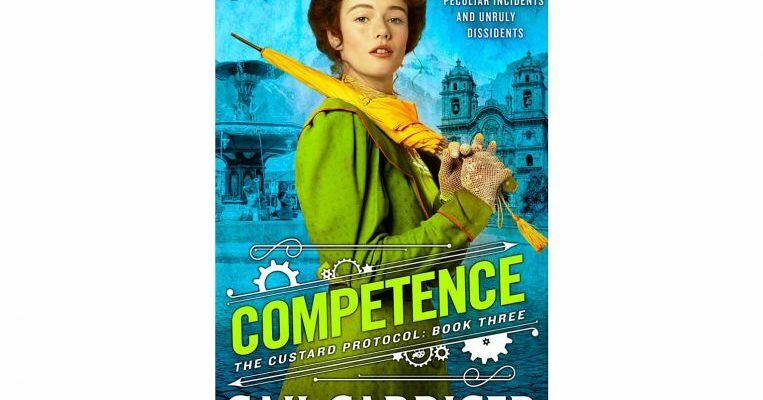 Fast forward two years and the third and latest book in her Custard Protocol series, Competence, does indeed open in a supernatural, steampunk version of 1890s Singapore, which boasts a bustling way-station for airships and where wild Merlion attacks are a concern for trade. While no actual Merlion appears in the book, the beast does play a role in the plot from offstage. Steampunk is a sub-genre of science fiction that imagines an alternate universe, usually in the 19th century, where technology is based on steam power. Carriger’s universe includes airships which travel using “aetheric particles”. “I really love the idea of Singapore as a port city,” says the American archaeologist-turned-author over the telephone from California. “It was already established as a shipping port city, so I thought it would naturally also be an air port city. The Custard Protocol books follow the exploits of Prudence “Rue” Akeldama, the daughter of a werewolf and a woman with no soul, who was adopted by a vampire. She has left Victorian high society to captain a dirigible around the world. Competence opens with Rue’s best friend Primrose Tunstell, the ship’s purser, stranded on Singapore with a were-lioness, Tasherit Sekhmet, after the airship has a helium accident. Carriger follows steampunk literature published in English by South-east Asian writers and says she is a fan of the 2015 short story anthology The Sea Is Ours, edited by Jaymee Goh and Joyce Chng. As a steampunk writer who loves Victoriana, she has to grapple with depicting the problematic aspects of British colonial history. Rue has the ability to temporarily steal the powers of supernatural beings through touch, which Carriger sees as a commentary on the Victorian notion of “going native”, or taking on the outlook of the locals while living in a colonised region. “I always have a ‘found family’ policy in all my books,” she adds. “My characters end up leaving the Victorian empire and its ideals behind and marrying, collecting and adopting people of other cultures, ethnicities and sexual orientations,” she adds. Her other works include the critically acclaimed Parasol Protectorate series, featuring Rue’s soulless mother Alexia Tarabotti, and the Finishing School quartet, about an airborne school that trains young ladies of quality to be spies and assassins. Carriger, whose real name is Tofa Borregaard and who lives in California with her partner and cat, was a full-time archaeologist until a decade ago, when she traded in digging and dating artefacts for fantasy fiction. Competence gave her the chance to return to a familiar locale: the Peruvian highlands, where she has spent time on digs and which she considers to be one of her favourite places. Rue and her crew travel to Peru on a mission to investigate an endangered breed of vampire. She is now working on the final volume of the Custard Protocol, which will be out next year. Although she misses archaeology, becoming a writer has always been one of her five life goals. The others are sleeping in Pompeii, owning a motorcycle, travelling to Egypt and eating guinea pig. She has achieved all of these except, surprisingly, travelling to Egypt. Competence ($40.77) is available from Books Kinokuniya.